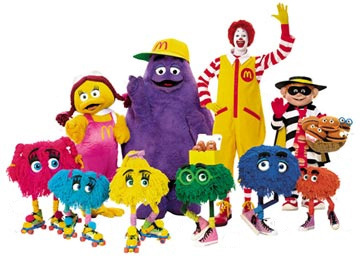 I’ve recently rediscovered my love for McDonald’s hamburgers. At one point in high school I was convinced that I could eat two McDonald’s hamburgers for every meal indefinitely. Not to date myself too much but back then a McDonald’s hamburger was 59 cents. Two of them came to exactly $1.25 including Connecticut sales tax. That meant that the quarter that I pocketed each weekday from the lunch money my mother gave me was enough to buy a late night weekend meal with my friends after an evening spent at the video game arcade. Seriously, how did video arcades survive into the 1990’s? So a few weeks ago, I had a craving for a McDonald’s hamburger… Wow — I’d venture to guess that I had my very first hamburger there in the late 1970’s and today, in 2010, they taste exactly the same. There’s just, well, I don’t know what to call it, but there’s something about the texture of those bland and flavorless little onion bits and the piping hot pickle and the less than fresh bun that looks like it’s been stepped on. It’s like peculiar form of perfection. They’re not 59 cents anymore but they’re still a pretty decent bargain. That thing tastes like cardboard. 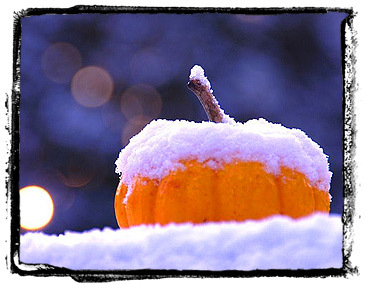 We had our first snowfall of the season here in Connecticut this afternoon — pretty early for us too. I mean, I haven’t even started raking leaves yet?! Anyway, there isn’t much in the way of accumulation (it’s still snowing) but it’s as though the people on the road have *never* seen snow before. I hate how that happens. Really, tonight my three mile commute home from work took…50 minutes!?. How ridiculous is that? In my prime, I could *run* that distance in under 16 minutes. In fact, I could’ve walked home faster. I titled the post Chicago-style commute because I’ve never encountered traffic worse than that of greater-Chicago. Three miles in a little under an hour seems about right. It’s no wonder that my dad took the train to work when we used to lived there. I’ve heard the rumblings for years now that Microsoft would be giving the axe to their entry into the personal finance software realm but now it’s apparently on it’s deathbed. I first purchased Microsoft Money back in 1997 — according to my entry in, yes, Microsfot Money, I paid $52.95 for it in March of 1997 at the now shuttered Circuit City. Thinking back, and looking at the entries around it, I’m truly surprised that I dropped that kind of coin on something that wasn’t a video game (Diablo, anyone?) or something relating to ice hockey. Yep, I was able to accurately watch my credit card debt swell to over $30k. So, anyway, my first version of Money was Money ’97. It was pretty solid — as a 21 year old, I liked it enough to actually sit down each week and enter every single transaction. That’s saying something. Eventually I upgraded to the 2002 version. It seemed a little buggy but it certainly looked a lot nicer. Perhaps buggy isn’t the right term — I don’t wanna get all those Mac-holes worked up. I found the “wizards” and “auto-budget” features annoying. I hoped that the issue would correct itself when I upgraded to the 2005 version. It wasn’t perfect but that’s the version I still use today. Shortly after I got married, I hooked my wife up with the 2007 version. The logical transition would be to migrate towards Quicken. I’m not happy about it but I’m not against it either — my concern is that importing my thousands and thousands of entries from MS Money (a defeated competitor) will be, well, hit-or-miss. Why don’t you just keep using your version of Money, Brainy? That’s a great question. I wish I could! 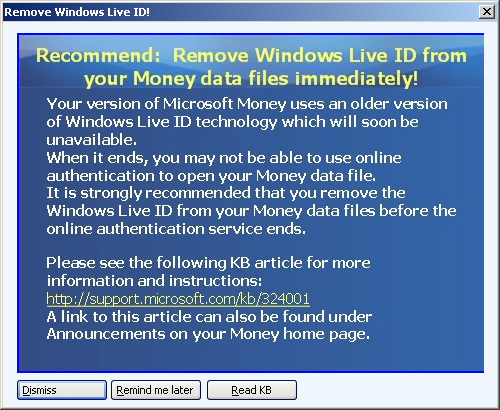 That “nag” screen above mentions something called Windows Live ID technology. Yeah, I do the online banking thing, but I don’t let the bank update my records. I can take care of that manually (offline), thankyouverymuch. So, I ask, has anyone made the switch from MS Money to Quicken (or anything else) without too much of a problem importing data? I’ve mentioned a few times that one of the monitors that I’ve been using to type up these posts was one that I bought way back in 1997. 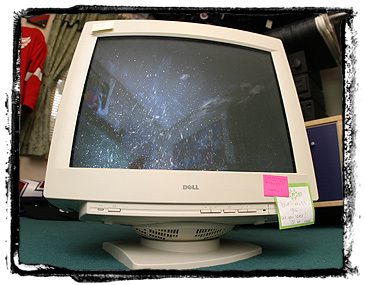 It was a 21″ Dell Triniton which, at the time, was the top of the line. You couldn’t get a monitor bigger than that back then. I paid around $2500 for it. It was almost a status symbol to have the giant thing overpowering my desk. Of course, at the time, I was living in my parents and I had it set up where I’d had a 13-inch television hooked up to a Nintendo years before. Yep, it was a status symbol that I could hardly flaunt. Yep, it was a DUMB purchase. Anyway, I remember when it arrived — the damn thing weighed around 80 pounds, way heavier than a comparable sized television. It was one of those awkward sizes too where it was tough just to get out of the box. Too deep to get your arms all the way around or navigate through a doorway, you know? And then when I hooked it up and turned it on, my excitement quickly turned to disappointment. What the hell were those two slightly darker horizontal lines running across my desktop? I spent over 10% of my salary for this thing — it should be perfect! An A/V minded friend pointed out that those lines were how you could tell that it was a Trinitron. Gotta love it — somehow the folks at Sony convinced the buying public that a terrible flaw was really a feature. Pure genius on their part. Any how, last night, after 12 years of loyal service, I disconnected it and took it off of my desk and replaced it with a $189 Samsung. I’ve been using a two-monitor set-up for years now — one 17″ LCD and the big 21″ CRT — and, lately, I’ve found that I’d much prefer to have two identical monitors rather than a mismatched pair. It’s funny, barely cold and still carrying a mighty static charge, that old monitor already looks like a junky old relic as it sits on the floor. And to think, just yesterday, it was my beloved workhorse. Unlike my previous post, this one actually is about Michael Jackson. Even though I wasn’t born in the US, if I had been, I’d be one of those bicentennial babies. What that basically means is that the Jackson 5 were a little before my time. But it also means that I was the perfect age for MJ’s solo career. My parents were still listening to popular music when “Off the Wall” came out in 1979 so I got my share of “Don’t Stop ’til You Get Enough” and “Rock With You” riding in the back of the car. I don’t remember either song being a favorite (neither could top Queen’s “Another One Bites the Dust” or Christopher Cross’ “Ride Like the Wind”), but I certainly remember hearing them an awful lot. By the time Thriller came out, sure, my parents had turned the dial to the oldies stations instead but I was six years old by then — I had access to my own radio dial. Best of all, our next door neighbor was an audiophile. His “band” was the Who but he also had the Michael Jackson album before anyone that I knew. I’m not sure he’d be willing to admit it but he had it in his collection probably the same day that it came out. My friend Chris and I even used the “Ma-Ma-Se” thing as a greeting? Weird. We were living outside Chicago at the time and I remember walking to school with Chris and his older brother Kurt pretending that the sidewalk was lighting up in front of us like it did in the “Billie Jean” video. 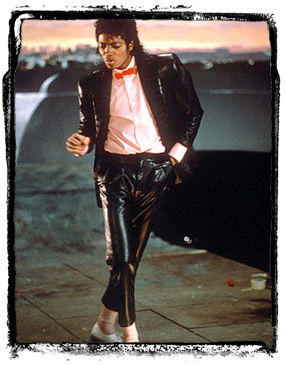 I also remember very long sessions of attempting to moonwalk on the kitchen tile with our slipperiest socks on. I never quite mastered it. As 1st graders, we had no idea what the song, “Billie Jean”, was about but we certainly knew all the words. When “Beat It” came out, well, game over, everyone that I knew was asking for the Thriller record for their birthday. I got it on tape that summer — along with a tape recorder. Then we moved to Connecticut and my access to Hi-Fi music was dashed. But with the move to New England came something new — cable television and MTV. Not only could I listen to MJ, now I could see him too! I’d seen the videos before, probably on Solid Gold or something, but never over and over and over again. I remember when the Thriller video came out — I think it was even listed in TV Guide — my parents even watched. And they enjoyed it! Imagining my son being 7 years old now instead of one month, I’m not sure I’d be able to “enjoy” the music or the videos he might be watching right now. Somehow, in the early 1980’s Michael Jackson was able to appeal to 7 year olds AND 37 year olds. My next big MJ memory came a few months after the big Thriller music video. I had the jacket from Thriller in 3rd grade — it was awesome. Yeah, my parents were too cheap to buy me a glittery glove that I also wanted but they totally went all out and hooked me up with a red and black pleather jacket. Did I mention yet that it was awesome? I remember it almost having a Michael Jackson like effect at the bus stop. No, the girls weren’t passing out or anything just being in my presence but they were asking to try it on and I thought that was pretty cool. While I can’t prove it here with photographic evidence as I’m not sure a photo of me in the jacket even exists — thank god, too, evidence like that would have jeopardized my popularity in high school — trust me, I had it. And it *was* awesome. I’m sure that if I dug through the attic enough, I’d find it. Or maybe my parents still have it? Mom? The next time Michael Jackson came up was when I was just heading into junior high school. It was the end of the summer and I had a birthday party to go to and I wanted to buy the “Bad” tape for my friend Ryan. Problem was, the album was being released the day of the party *and* it went over the $10 birthday present limit my mom had set. 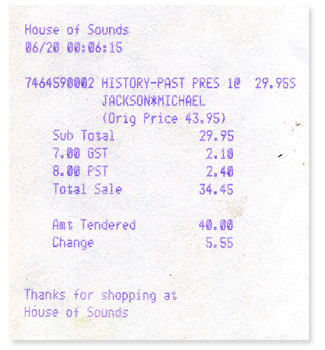 (Yeah, back then, cassettes were $16.99 for a new release). My mom ending up buying the tape last minute (going over the $10 limit) and as my friend was opening his other presents, I was a little worried about how he’d react to mine. I remember after the party, when his mom was driving us all home, she had the tape playing in the car (they were loaded so, unlike the rest of us, they had a tape player in the car – remember, this is 1987!) and we were all in the back clapping along to “The Way You Make Me Feel” which was the first song on the album that none of us had ever heard before. If I remember correctly, that was pretty much the last real birthday party that wasn’t just a sleepover with a few friends that I ever attended. Later that week, we were, afterall, junior high schoolers and far too grown up for “Fudgie the Whale” cakes. His next album was “Dangerous” with the big prime time network debut of the “Black or White” video and the morphing faces at the end. I was in high school at this point and while it was okay to admit that you thought the end of his video was cool, it was best to keep being a fan on the hush-hush. I bought his Dangerous album in Germany on tape because, yeah, I didn’t have a CD player yet and because I was certain that I would probably never again see any of those Germans there to witness me purchasing it. Yeah, in 1992, there was a little bit of shame in admitting that you liked Michael Jackson *and* Pearl Jam. I’d say that it was the first MJ album that I didn’t play the crap out of. It’s not that it wasn’t worthy, but I think my tastes had begun to slide over to less mainstream stuff like They Might be Giants. And, um, Pearl Jam. Crazy to call a guy like Michael Jackson mainstream, huh? The last time I gave Michael any thought, prior to Thursday, was when HIStory came out in 1995. It was in the summer of 1995 and I was taking a few courses in University. My friend Alison, almost as a joke I think, suggested that we line up to buy the album at midnight. Thinking that sounded like more fun than watching Baywatch and Unsolved Mysteries reruns I said that I’d be up for it. When we got to “House of Sounds” on Princess Street in Kingston, which still sold records at the time, there was already a line up?! I couldn’t believe it!? At a time when few would admit to even liking Michael Jackson, he could still get people to line up in the middle of the night to buy one of his albums. Amazing. I’ve never carried a Discover Card. See, I’ve only ever carried Visa and MasterCard. I don’t feel privileged enough to carry an American Express card. They’ve softened the message some, of late, but they still have that obnoxious “Always a good decision” Sam Adam’s commercial feel to them… You know the one I’m talking about — the one that Sam Adam’s seems to have had successfully removed from YouTube. Damn them. Though nearly 25 years old now, Discover is still the new kid on the block. I remember when they came out. They had that catchy jingle (which oddly escapes me at this moment), a cool sun logo, and an application inside the back cover of every Sears catalog — which, at the time, was second only to the Service Merchandise catalog. I wasn’t old enough then to actually have a credit card but I was old enough to know that I didn’t really want the one from Sears — the most embarrassing store to be seen with your mother in while shopping for back-to-school clothes..
Of course, AE commercials usually failed to make mention of the fees involved in becoming and remaining a “member”. So along came the Discover Card. They never had fees. I don’t think they ever denied an application. And I’m pretty sure that they invented “reward” programs too. As a result, they attracted a less than desirable crowd. Discover attracted the Sears crowd whereas American Express was attracting the Tiffany crowd. 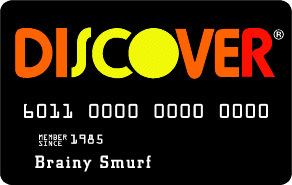 Discover is like the anti-American Express. So anyway, back to the additional “reason” that I still chose not to carry a Discover Card. The fellow immigrant at work frequently peppers me with trivia-like questions about the places I’ve been — many of which he’s been to as well. He’s not actually testing me, though, I think he’s genuinely interested in what my answers are. Thankfully, this time, my answer was correct. Of course, one guy (yeah, the type that seems to have snopes.com bookmarked on his desktop to stifle any entertaining conversation that may start up) had to disagree with me claiming that “Google” says that there are actually 13. Having now had time to count them in my head, I told him that Google is wrong — the three up north are territories, not provinces. I agreed and disagreed at the same time but didn’t say anything as I nodded. Hmmmmm… I didn’t know that. After a little research it appears that he is correct — it’s pretty much only accepted at the tourist traps that Americans frequent. And another reason I’ll never apply for a Discover Card. …as if the stigma of actually having one weren’t enough on its own! This past Sunday while doing some baby shopping I saw someone that I recognized instantly. I’ve known that he lived nearby for years and years now but this was the first time that I actually saw him. That might not sound so unusual — there are millions of people “nearby” — but how many people are over seven and a half feet tall? Yep, my wife and I walked right by Manute Bol. Now I was never a basketball fan growing up but even I knew who he was — if only because of his height. But that height was unmistakable. Still quite a distance away, though there were no other people between us, my wife quietly asked me if I’d like to get my picture taken with him, you know, using her phone but I declined thinking he’d much prefer to be left alone — being a celebrity and all. When I was a teenager I once passed by Wayne Gretzky on an escalator when the LA Kings were in town. I was going up, he was going down. I didn’t. But I also never forgot the experience. In fact, I probably only remember it so well because I didn’t make a scene, or get his autograph, or even simply shake his hand. We just exchanged glances and went on our merry way. So as we get closer, Manute is just standing there on the corner digging in his pockets apparently just enjoying the nice weather we’re finally having. Then, as we got closer, he started to hobble towards us. Not towards us — as in approaching us directly, but he began heading in the direction we were coming from. With my Gretzky experience in mind, I looked up and smiled a little closed mouth smile at him as we passed by like ordinary people. Thinking about it, she was right. I began to wonder if I *should* have asked to have my picture taken with him. I’ll be honest — in this specific neighborhood, just being a black guy is enough to get some unusual stares. Being over seven feet tall would likely get you that much more though I’d imagine when you’re that tall, you’d receive some odd stares pretty much anywhere. Most people on the street that day probably thought he was some sort of freak. And that has me second guessing myself days later, you know, maybe he would have taken some pleasure in the fact that I knew who he was and that I’d really appreciate having my picture taken with him. Not because he’s a wicked tall freak of nature but because he’s Manute Bol. That dude used to be famous. As I’ve mentioned before, my home is old. Definitely over 100 years old. Probably even over 125 years old. Oh, and you don’t have to email me to let me know that it looks like crap and that I should get a new one. I already know that. And, hey, the old thing still works like a charm! 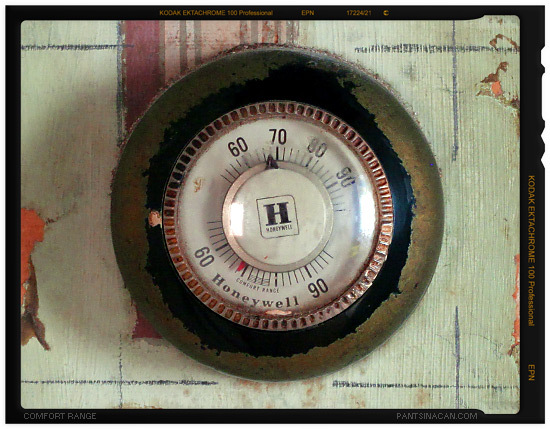 It looks like your standard round Honeywell thermostat, right? If you grew up in North America or western Europe, it should be pretty familiar. It may even drum up some warm fuzzy memories. If you were born in the 1990’s, well, this is how we turned the heat on in the dark ages, you know, before everything went digital and became programmable. My thermostat is a very early version of the T87 — a model that Honeywell released in 1953. If it were in better shape, it might even be worth something. Apparently one is even displayed in the Smithsonian. I’ve lived in this house for over six years and I just noticed it earlier this week while researching my BFO post about turning the freakin’ heat down. At the bottom, just above where it says “Honeywell”, they’ve highlighted a so-called “Comfort Range” between 72 and 78 degrees Fahrenheit. It’s about as warm as it gets in here during the winter months and I’m still 4 degrees shy of the “comfort range”. After Two Years Off…I’m Back! Sun Comes Out, School Dismissed. What?